Carbonell, J.M. ; Suarez, B.; Oñate, E.
Carbonell, J.M. 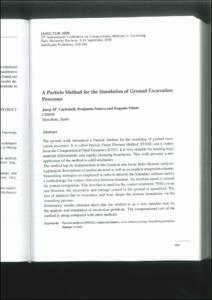 ; Suarez, B.; Oñate, E. A particle method for the simulation of ground excavation processes. A: International Conference on Computational Methods in Tunnelling. "EURO, TUN 2009 : computational methods in tunnelling : proceedings of the Second International Conference on Computational Methods in Tunnelling, Ruhr University Bochum, September 9-11, 2009". Ruhr University Bochum: 2009.